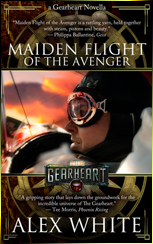 The team here at The Gearheart is proud to present the first episode of Maiden Flight of the Avenger! We hope you enjoy this prequel novella starring everyone’s favorite mechanic, Augustus Elsworth! Boy is it nice to hear Gus & Isabelle again. I’ve missed them so! Now I’ve just got to survive the week in between episodes! GAK! Couldn’t wait to listen to it. Well done! Dulcet tones do not do it justice and I’m glad to once again have more content to listen to. Caught your appearances over at The Galley Table at Flying Island Press, and my estimation of you does nothing but soar. 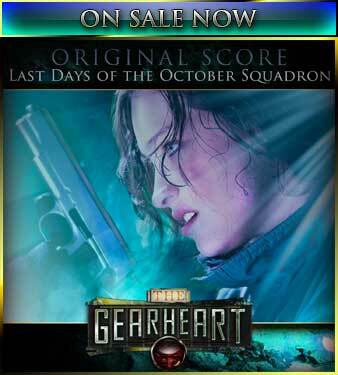 I discovered “The Gearheart” a few days ago. Listening to it has carried me through some crazy days of being chained to the computer trying to finish up projects. I’m thrilled to see I’m just in time for the beginning of a new story. I thank you, your wife and everyone else involved for delivering such engrossing, high quality entertainment. Excellent job! I always enjoy listening to the show and Augustus just make me smile. Keep up the good work. It’s been MONTHS since I’ve been waiting for another podcast from one of my favorite authors…….I’m truly thrilled to see this story starting again. It truly encourages me to continue in my endeavors as a writer. Thanks a BUNCH Alex, and keep up the good work! I just finished The Gearheart and I’m eager to dive into a new adventure. I have so much I want to say about your story (good things)…but alas, I’m typing this from my phone. I hope a simple “kudos!” will suffice until I can articulate my appreciation in what will likely be a rambling diatribe of fandom.